Set on four-tenths of an acre, this charming historic home at 210 Bennett Street is a rare find. 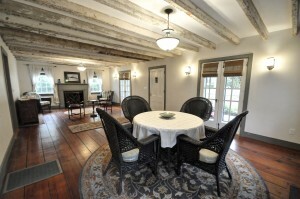 The house was built in 1835 and is one of the oldest homes in all of Mount Pleasant. It has stood the test of time and has been thoughtfully updated throughout the years while keeping its original charm intact. The 3,158 square foot home is set back on the property so there is a lush front yard with a brick pathway leading to the front porch. 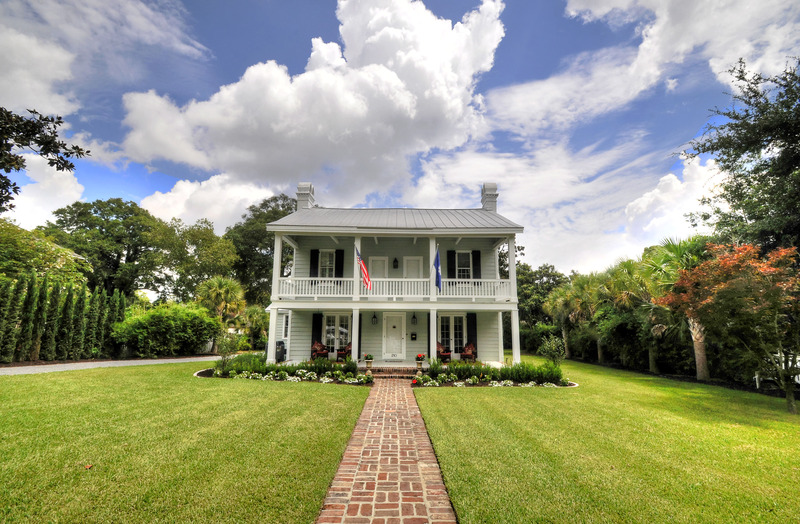 Palmetto and cypress trees add privacy and the yard is completely fenced. Upon entering the home, you will be greeted by the open living and dining area. Two sets of french doors open onto the covered front porch allowing great natural light to filter into the space. Exposed rafters evoke the home’s history as do the original fireplaces and wide plank heart pine floors found in this space. 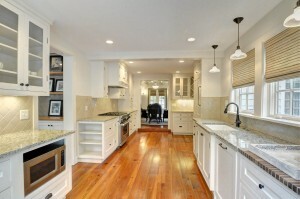 Just beyond the living and dining area is the home’s show-stopping kitchen. Outfitted with high-end finishes such as neutral granite counters and tile backsplash, it blends well with the rest of the home. High-end stainless steel appliances are perfect for cooking and the abundance of custom cabinetry and counter space is also ideal. Recessed lighting, pendants over the sink and under-cabinet lights illuminate the space while french glass doors add natural light and open to the home’s newly added back deck and brick patio. 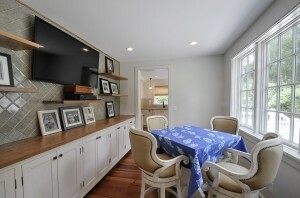 A sunny breakfast room is found off the kitchen and it has a built-in hutch for additional storage. A mudroom, complete with lockers and storage benches, is also convenient. A sitting room with built-in bookshelves and a powder room complete the first floor. Upstairs are the home’s three bedrooms. 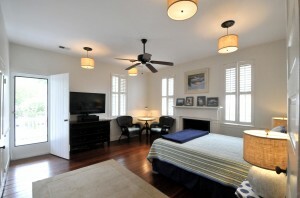 The large master bedroom has beautiful hardwood floors along with an original fireplace. A glass door opens up to the second-story porch which looks out over the landscaped front yard. The walk-in closet has built-in storage and connects to the en suite bath which has been recently updated with marble-topped dual vanities, a tiled shower and luxurious chrome fixtures. The other two bedrooms are found on this floor and there is a shared bath which has been updated with a tiled shower, a marble-topped vanity and a reclaimed wood wall to add visual interest. On the third floor of the home are two additional finished rooms which could be used as bedrooms, an office or flex space; lots of potential! A two car detached garage and driveway provide plenty of room for off-street parking and there is a semi-finished attic space in the garage for additional storage. The home’s location is also ideal. Walk to the weekly farmers market, go for an evening stroll on the Pitt Street Bridge or pop into one of the local neighborhood restaurants or shops in the Old Village. Sullivans Island beaches are just a short bike ride away and downtown Charleston is just a ten minute drive. To learn more about this home or to see it in person, contact listing agent Jimmy Dye.